Silly robots to color! Bring these characters in this coloring book alive by using your own media: colored pencil, crayons, markers and more. Illustrations are printed on one side of the page so they can be easily removed and displayed. 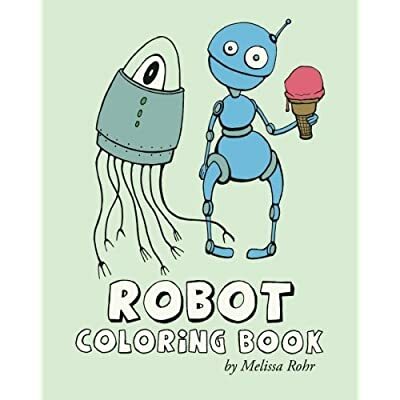 This coloring book features 20 unique illustrated robots to color: Robot in Rocket Ship, Robot with Ice Cream, Tentacle Robot, Parachuting Robot, Robot Octopus, Racing Robot, Robot with Bubbles, Robot Butterfly, Robot with Flower, Rolling Robot, Robot with Guitar, Fishing Robot, Robot with Kite, Rocket Robot, Robot in Rain, Robot with Lollypops, Bicycling Robot, Robot Holding Bird, Rockin' Robot, Robots in Love. All illustrations copyright 2013 by Melissa Rohr.